The kitchen is the center of all the action in your home. Whether you are cooking, eating, or entertaining, the kitchen is where its at. The design of your kitchen can make a huge difference in your life. Even if you are tight on space, there are things you can do to make this important room comfortable and inviting. From installing kitchen cabinets to tiling your backsplash, the tips in this section can help you create the kitchen you've always wanted. Some of the great ideas you'll find here include finding extra storage places and discovering alternatives to using cupboards. The following articles are available for the 'Kitchen' topic. Click the article''s title (shown in bold) to see the associated article. Are you tight on space in your home or apartment? It always seems that we have more kitchen gadgets to store than space in which to store them. Here are some great ideas on how you can get the extra storage space you need. One of the most common areas to work on in the home is going to be the cabinets and countertops that you have. After all, these areas see a lot of hard use, and as such go through a lot of wear and tear. Before you begin working on any repairs, make sure that you have the proper cabinet and countertop toolkit prepared and ready to go. One of the most important elements to any successful kitchen is the sink, and sadly one of the most overlooked. Many people will simply pick a random sink and hope that it will work out alright. The truth of the matter is that there is more to choosing a kitchen sink that's right for you. Installing a garbage disposal yourself is a task that almost every homeowner, or do it yourselfer can do. Why spend the added money of hiring someone to do the work for you, when you can easily get the work done yourself? All you need to do is follow these instructions in order to get the job done the right way. After a while, everyone wants to change the look of their kitchen. This typically entails the need to do some cabinetry work. Whether you are totally replacing your cabinets, repainting them or refinishing them the time is going to come where you are going to have to install kitchen cabinets. Here is how you can do that yourself without having to pay an arm and a leg for a professional carpenter to do it on your behalf. The cabinets in your kitchen should meet your specific needs. Choose the right cabinets for ultimate efficiency and storage space. Remodeling your kitchen and replacing the existing cabinets can be a pretty expensive project for just about everyone. A less expensive option would be to do some kitchen cabinet re-facing. Surprisingly, this is a project that, while time consuming, isn't really all that difficult. Does your kitchen seem old and outdated? Give this area a makeover to get a fresh look. If you are looking to get new countertops in your home, then chances are you have at least considered laminate countertops at one point or another. Before you make your final decisions about laminate countertops though, it might be helpful to learn a little more about them. Here is some great information that tells you what you need to know about this modern main stay in countertops. Whether you are looking at taking the opportunity to change the whole look of your kitchen, or you are simply painting your kitchen cabinets the same color they were before this is going to be a fun and easy project. There are only a few simple steps that anyone has to take, and they are going to have their old cabinets looking like new. Refinishing kitchen cabinets can bring much needed life and vitality to any kitchen, and is quite often less expensive and time consuming than undergoing a complete remodel. Here is how you can get professional results, without paying the professional price, when refinishing your kitchen cabinets. Dishwashers are a vital and key part in the running and care of kitchens today. One of the problems that a person may be faced with is how to go about choosing a new or replacement for any dishwasher. Here are some guidelines that anyone can use to help in choosing their next dishwasher. Refrigerators are a vital necessity in anyone's kitchen, and they get a lot of use and abuse. Due to the very nature of a refrigerator, choosing one can be a very personal matter. Here are some guidelines that can help you the next time you need to replace yours. It has often been said that the kitchen is the heart of the home. If true, then it could easily be stated that the stove is the heart of that heart. The stove is usually one of the most important parts of a kitchen, and where people gather when they are cooking their meals, here are some guidelines to help you choose the best stove for your new kitchen. It is becoming more and more common for people to spend time in their kitchens. Over the years, this means that we have come to desire more space in our kitchens, often more than we can actually have. If you find yourself in need of some great space-saving kitchen ideas, then you're in luck. Your kitchen doesn't necessarily need more drawers or cupboards in order to fit all your appliances into it. 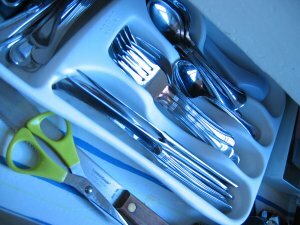 There are many different ways to utilize more storage space in your kitchen that you would probably never even think of. After all, who couldn't use a few more space-saving kitchen storage ideas? If you are looking to truly make your kitchen unique, then you may be looking to have a tile backsplash. Tiling a kitchen backsplash is a great do-it-yourself project that just about all DIYers can do, if they only take the time. You'll be surprised at how easy it really is. Over time, even the nicest of cabinets will need a little touch up work. Why spend the time and money to completely replace your cabinets, when all you really need to do is apply a little touch here and there. Touching up cabinets can be remarkably easy, if you know what to do. Dishwashers are a great and wonderful thing to have in your kitchen, or they are when they work properly. Troubleshooting dishwasher problems is something that every owner needs to know, if only so that they don't need to worry about longer cleaning times. Here are some basic methods for troubleshooting dishwasher problems. A clogged disposal unit can be pretty a pretty formidable task for the amateur plumber. Using these simple steps, you too are going to be able to get your disposal unit back into working order. Snaking a drain is one of the more sure-fire ways to clear a clog out of any drain. Follow these simple steps, and you will be able to clean out your drains like a pro. There are many ways that a person can unclog their kitchen sink. The most expensive way is to call a plumber in to do the work for you. Probably the easiest and cheapest way is to do it yourself with a plunger. With these simple steps you will be able to start down the road towards becoming your own plumber. Unclogging a drain can be something that is extremely messy and difficult for the amateur plumber. Follow these simple steps to use a wet/dry vacuum for a new and creative way to unclog that drain. It's a fairly easy thing for most people to be able to fulfill their own home plumbing needs. Follow these simple steps and you will never need to call a plumber for the simple fixes. FREE SERVICE: Receive an e-mail several times each week with a featured home improvement tip. Enter your address and click "Subscribe."